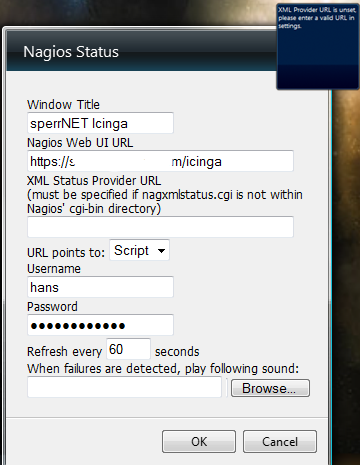 I’m sure the most people already know Nagstamon which is a small handy tool to display the overall Nagios/Icinga on different platforms. 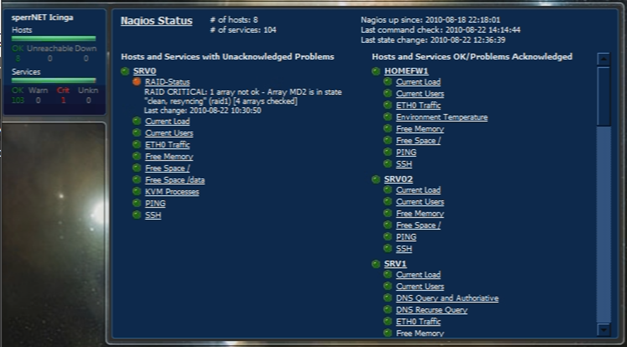 But because I mainly use Windows 7 at the office and at home (have a Debian-Dualboot at home, but mainly use Win7) I wanted a Windows Sidebar Gadget to display the Icinga Status. After a short web search I’ve found Nagstatus, which is a very nice look Windows Sidebar Gadget which grabs the status from a XML-Stream which is provided by an own CGI. There are just a few steps to get it up and running. After the installation is completed you must provide the path to your status.dat file. So just open the nagxmlstatus.cgi with your favorite editor and edit the $STATUSFILE-Variable on Line 15. An XML-Stream should be displayed with the current state of your hosts. 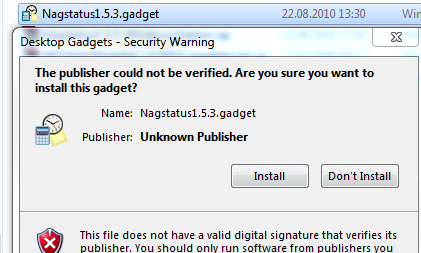 So, the last step is just to configure the Nagstatus-Gadget to point to your server. Just rename the before downloaded ZIP-File to *.gadget and double-click it. Move your mouse onto the gadget and a small screw wrench will appear. Click on it so the options will pop up. Just enter the missing information and confirm the settings with OK. When clicking on the gadget a more detailed windows hovers up. In my opinion it’s a real cool looking gadget and at least for Windows a good replacement (or addition) to Nagstamon. Thanks for this tutorial. I tried on my system and it works very well. I can’t run the script on the server without sudo in front of it. Is this permissions related?